Despite his rank as Number VII, Saïx is actually much, much more prominent within the infrastructure of the Organization as Xemnas' second-in-command. Loyal, impassive and stoic to the point of eerie and cruel, Saïx is the Lunar Berserker, fierce wielder of the claymore which he uses at full power under the full moon during his Berserk state. Saïx makes his debut in Hollow Bastion amidst the ranks of Xemnas' posse that goes to taunt Sora; while he does not stay behind to tease the Keyblade Wielder like Xigbar, he tells him, "You're doing well," which is possibly referring to Sora's being alive or Sora's defeat of the Heartless, the latter of which furthers the Organization's plans. A great amount of time passes by before Sora sees hide or hair of Saïx, who makes a trip to Twilight Town during Sora's second visit after the Keyblade Wielder and his friends save Seifer and his gang from Nobodies. He says nothing more than warning the gang of the maverick Axel whose plans will render Sora as a Heartless (again); after making a rather subtle threat about ‘knowing very well how to injure a heart', Saïx summons a portal through which he takes his leave - but not before he lets on to Sora that he knows something about Riku. He reemerges in The World That Never Was and reports back to Xemnas that he has succeeded in confounding and frustrating Sora - two acts that will give Sora more drive and will consequently have him further their plans - as well as warning Xemnas that Axel's position is becoming troublesome; at this, Xemnas orders Saïx to deal with Axel. Saïx next shows his face at Radiant Garden after the 1000 Heartless battle to stop Axel from opening his mouth too much to Sora. Once Axel flees, Saïx dangles the prospect of seeing Kairi like a carrot in front of Sora's face; even after Sora proves - by literally begging - how much he cares for the girl, Saïx refuses anyway - such is his humor. For the rage that this brings out in Sora, Saïx calls forth Heartless for Sora to slay, as is his goal; after a quick intervention from Maleficent, Sora destroys them, releasing their hearts - bringing Saïx pleasure. With a grin, he exits. Saïx's last appearances all occur in his homeland, The World That Never Was, where he is seen taking Kairi to a cell since he knows Sora will battle through thick and thin to rescue her and in this he will become the Organization's tool. When Naminé helps Kairi escape later, Saïx is the one to waylay them with the help of his Berserker Nobodies before he is attacked by a hooded Riku in the form of Xehanort's Heartless, signaling Saïx's escape. He moves to cause more trouble for Sora before the battle with Xigbar; after a teasing remark about "a friend from the darkness" (Riku) and a spiel about his precious Kingdom Hearts, he summons more Heartless for Sora to eliminate before an appearance from Maleficent and her sidekick Pete spell his exit. He is seen resurfacing atop the Altar of Naught with Xemnas, who grants him permission to end Sora. True to form, Saïx lies in wait in his lair - Addled Impasse - whilst he soaks up the rays of his beloved moon which will grant him the power he needs for battle. Once Sora and co. enter, Saïx launches into battle, all traces of his once-amused etiquette blasted away by the fury that envelops him. Though he lashes out relentlessly with his extreme power, it is not enough to overcome Sora. With one last look at the moon and a too-late wish for the return of his heart, Saïx flutters away into death. A blue-haired, scar-faced Nobody who shares a close connection with Axel; number VII of the Organization. 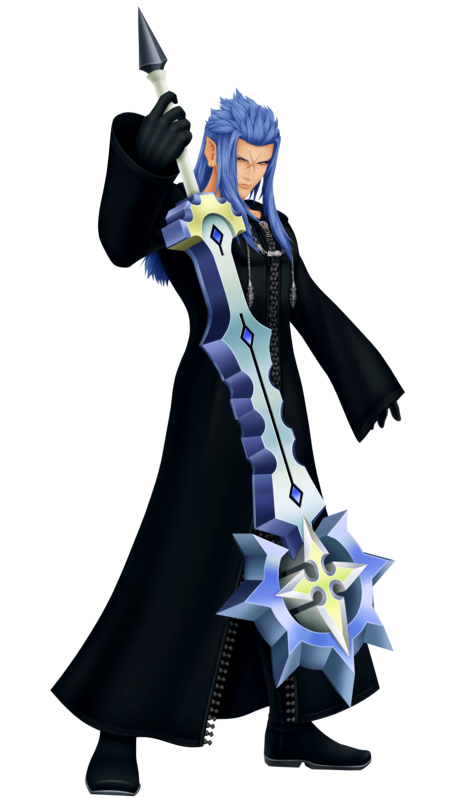 In spite of being seventh in number, Saïx is the official second-in-command of Organization XIII, and all members save Xemnas report to him to receive their daily missions. As is expected of the Superior's right-hand man, he is unflinching in assigning duties and dispensing justice, no matter who it is at the receiving end. To all appearances, he is the quintessential loyalist: cold, firm, and always obeying. This image, all coldness aside, is in fact nothing more than a ploy to get inside Xemnas' inner circle. He and Axel plan in secret to put an end to Xemnas' rule and take the Organization in their own direction. However, as Axel's friendship with Roxas and Xion grows stronger - to the point of direct disobedience - a definite strain is put on their plans. Saïx, who knew Axel since before they both were Nobodies, is as close to disgusted as a Nobody can be at how Axel has changed from before. His "feelings" towards Roxas and Xion are no less unpleasant; he sees them as only mere tools, and casts one aside whenever their powers begin to wane. Xion in particular receives the worst treatment; since Saïx is aware of her nature as a replica, she is an "it" whenever he refers to her. When Roxas eventually tries to escape the Organization, Saïx bars his path at the exit of the Castle That Never Was, and uses the full force of his power to try and stop him. 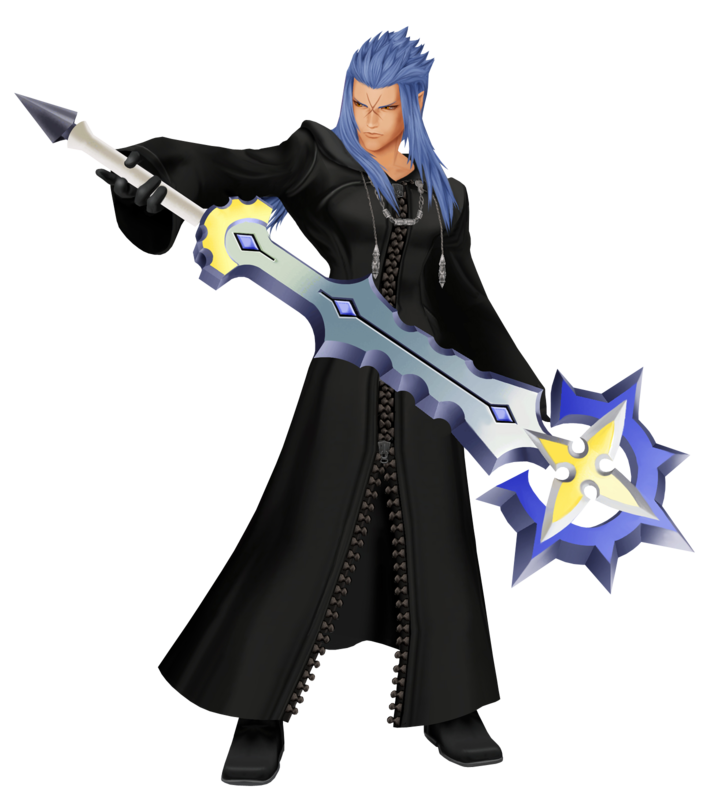 The power of the Keyblade, however, proved to be too powerful an opponent, and Saïx was left gasping on the ground as the traitor Roxas walked past. 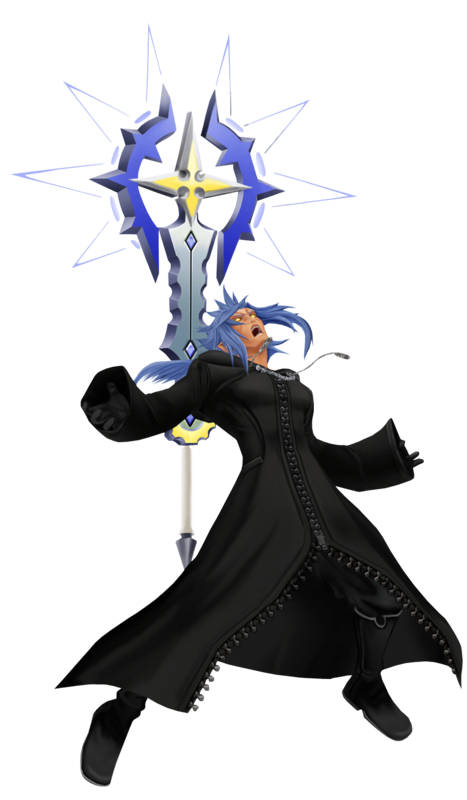 When in battle, Saïx's controlled and domineering nature asserts itself in the form of his massive spiked claymore, with which he deftly handles with an unusual backhanded style. While unremarkable in magical power, his swift, yet powerful strikes are nothing to scoff at, ruthlessly clearing enemies away with cold efficiency. However, this controlledness is sacrificed for a sheer onslaught of power when Saïx initiates his Limit Break, Berserk, during which his claymore's blades elongate drastically, and he enters a bestial rage, carving a path through enemies with powerful strikes imbued with lunar energy. This maelstrom of battle rage culminates to a series of what can only be described as explosions of power that level the battlefield. Lea's childhood friend now turned enemy; the two spent many a day eating Sea Salt ice cream and trying to sneak into the castle on their home world of Radiant Garden, but an unfortunate incident caused them to lose their hearts to the darkness, creating Axel and Saix. However, Axel's relationship with Roxas and Xion inevitably caused a break in his with Saix, and the two went their separate ways, with Axel fighting for the light and Saix for Organization XIII. Saix was defeated by Sora not too long ago, and hasn't been seen since. However, his lacking presence when Lea awoke in Ansem's computer lab seems to suggest something happened. This theory was proven outright positive when Isa, or Saix, under Xehanort's orders, attacked Lea after he rescued Sora. Abandoning his original name, his former self, and now become a Seeker of Darkness, he disappeared along with the other Xehanorts when time ran out for the gathering.